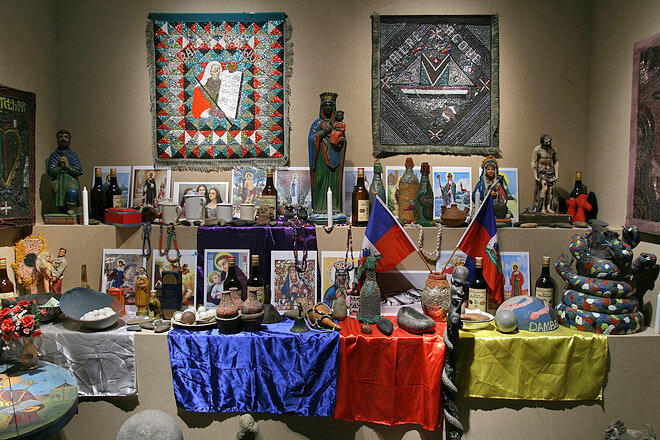 Altar of the Rada cult, installed in the exhibition. The lwa (spirits who exert an influence upon all spheres of life and who are at the very core of vodou belief) are divided into "nations", or nanchons, which relate to the various regions from which slaves originated. The two most important lwa nations are the Rada and Petwo. The Rada cult comes from the Yoruba culture of Dahomey (present-day Benin), while the Petwo cult has its roots in the Bantu cultures of the Congo Basin and Angola. Rada lwa are characterized as being calm, cool-headed, and benevolent, while Petwo lwa are considered to be quick, hot-tempered, and the actors in magic rites.